Home / Best Practices, Technology, Industry / Sustainable Packaging – A Fad or Fab? So what does that have to do with sustainable packaging practices? Read on to find out. A. Plastic production increased twenty-fold over the last 50 years – from 15 MT in 1964 to 311 MT in 2014. C. Only 14% plastic is recycled presently. 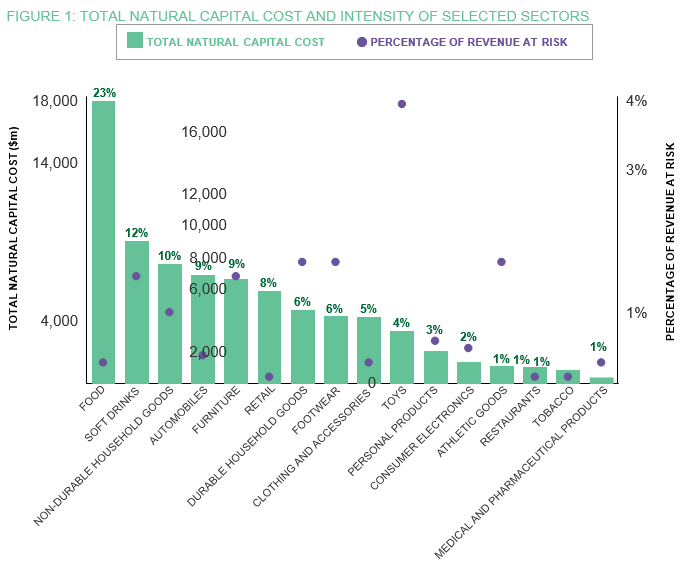 Note: the risk in the above infographic is the percentage of natural capital cost per $1m of annual revenue. A. Companies are minimizing single use plastic in their packaging as part of reduce initiative. C. Use of bioplastic or biodegradable plastic – plastics made from renewable biomass sources such as vegetable fats and oils, corn starch or microbiota. Word of caution: this initiative, while having definite benefits in reducing upstream impacts, is useless if downstream impacts such as disposal is not addressed through a dedicated network of collection system for bioplastic material. With a definitive UN deadline of 2022 to end wasteful usage of single use plastic, sustainable packaging is the way forward and companies are investing in research and innovative practices of their own volition. The most recent quantifying exercise by UNEP reports that $4 bn is the amount saved by consumer goods companies globally through good management of plastic such as recycling.